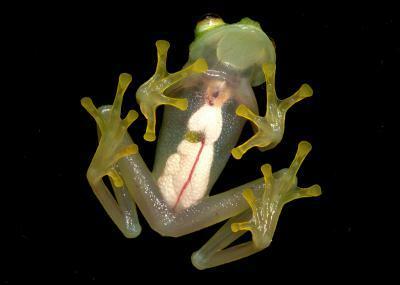 The delicate Hyalinobatrachium bergeri is the most abundant species of glass frog in the cloud forests of Manu National Park, Peru, where they can be found from ~800 to 2200 meters elevation. This is a new species of stream lizard from the genus Potamites. 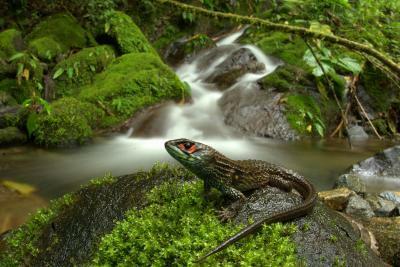 These aquatic lizards forage in streams in the cloud forest from 900 to 2000 meters elevation. Their ability to operate at low temperatures in high-elevation streams (i.e., around 2000 meters) is very unusual among lizards. UC Berkeley postdoc Rudolf von May of the Museum of Vertebrate Zoology discusses the reptile and amphibian biodiversity in Peru's Manu National Park. Von May, Alessandro Catenazzi of Southern Illinois University, Carbondale, and taxonomist Edgar Lehr of Illinois Wesleyan University have completed a survey of the park and its buffer zone, uncovering a greater diversity of reptiles and amphibians than any other protected area in the world.